I call this lazy gnocchi because you don’t have to form them into the characteristic shape… Instead, roll them into balls and treat them like mini potato dumplings. If you’re so inclined, by all means, take the time to properly roll them. About 1 cup gluten-free flour mix; I use 50% sorghum, 25% quinoa, 25% tapioca + 1 teaspoon xanthan gum for this, adding more sorghum if needed. Preheat the oven to 450 degrees F. Wrap the potatoes in foil. Bake for about 1 hour until tender. Meanwhile, to make the soup, heat the oil in a large saucepan. Add the leeks, celery, and carrots. Cook until softened and starting to caramelize, stirring often, about 10 minutes. Add the garlic. Mix until fragrant, about 1 minute. Add the oregano, basil, rosemary, and poultry seasoning, and sprinkle with salt and pepper. Stir and cook for 1 more minute. Add the tomatoes and water. Bring to a boil then cover and reduce the heat, letting simmer while preparing the potatoes. While simmering, carefully unwrap the potatoes and let cool about 20 minutes. Mash or rice them well, and spread them on a work surface. Add about half of the flour mixture. Using your hands, knead the potato/flour mixture to bring it together, adding more flour mix to create a soft, smooth dough. It should not be sticky or crumbly. Have patience—you will be kneading and adding flour for about 10 minutes. You’ll use about 3/4 to 1 cup of flour in total. 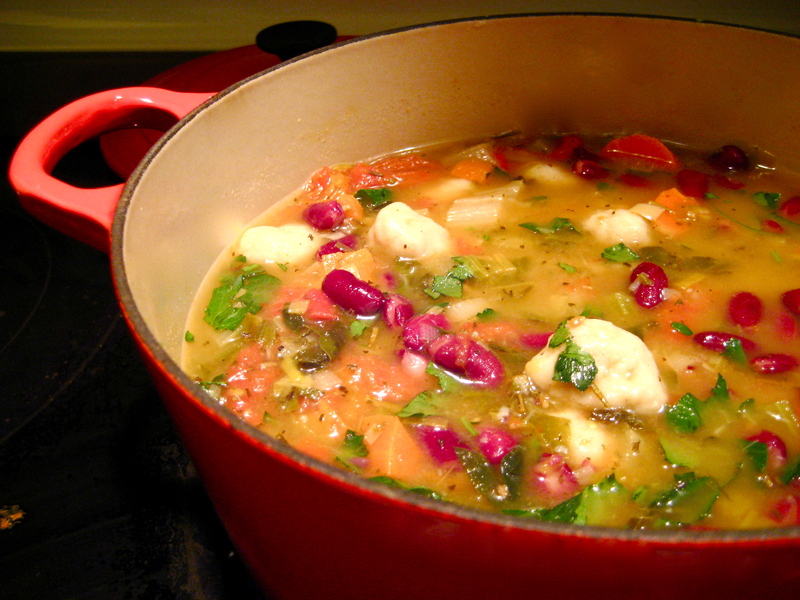 Once the dough has come together, take a moment to add the Swiss chard and kidney beans to the soup. Return to the potatoes. Use your hands to roll small 3/4-inch-sized balls of dough between your palms. Repeat until all dough has been used. Return the soup to a boil. If you find that there isn’t enough room for the gnocchi to cook, use a sieve to temporarily transfer some of the vegetables into a large bowl. Carefully drop the lazy gnocchi into the boiling soup. Cook until gnocchi rises, about 2 to 3 minutes. Stir in parsley and re-add the vegetables. Serve hot.